We are truly spoilt living in the top of the south, berries are bountiful, the cherry trees are laden, summer fruit and stone fruit are abundent. I, like my six year old son, would eat berries, until I could no longer move. I love the fresh, sweet yet sharp taste of summer fruit. Here is a light recipe, Zabaglione. It is great served on its own with sweet biscuits, but it really shines when it is spooned over cut summer fruit. It is light, fresh and very indulgent. Have a wonderful Christmas! 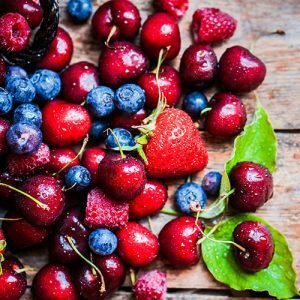 And don’t forget to head to Fresh Choice, Nelson for your blissful berries and delicious summer fruit. Bring 3 cm of water to a boil in a medium saucepan, and let it simmer. Add the egg yolks and sugar to a large glass bowl. Beat the eggs and sugar until the mixture is thick, pale yellow, and the sugar is completely dissolved, (4 – 5 minutes). Decrease the mixer speed to low and add the wine. Place the bowl over the saucepan with the boiling water, making sure the bottom of the bowl isn’t touching the water. Beat the mixture on medium speed, until it is thick, frothy, holds a ribbon, and the temperature reaches approximately 65 degrees Celsius. Arrange the cut fruit neatly on a plate, spoon the zabaglione over the top and serve with some garibaldi biscuits. Add the milk and butter, mixing to a firm dough. Turn out on to a floured board and roll out to 5mm thick. Cut in half and sprinkle 1 half with the currants. cover over the currants with the other half of the dough. Roll with a pin, to press together and cut into your desired shape. Brush lightly with water and sprinkle lightly with some more caster sugar. Bake at 190 degree celsiusfor about 15 minutes. It’s time to welcome back our Guest Blogger, Maddy Bellcroft. 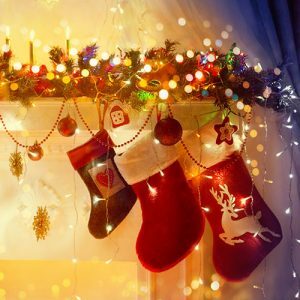 Christmas is coming, and Maddie has a list of Foodie Stocking Stuffers to inspire your Christmas shopping! 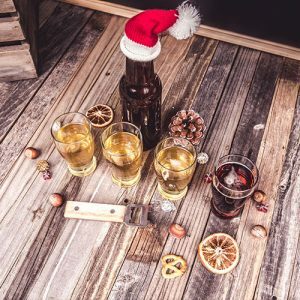 Christmas is just around the corner, so there is no better time to share with you my list of foodie stocking stuffers. These also make great Secret Santa gifts, and all products can be found in store at Fresh Choice Nelson, along with lots of other treats and gift ideas. Yum Granola – Darc choc flavour. My ultimate breakfast treat, well actually my anytime treat. Locally made and full of goodness. Beautiful with homemade almond milk, on smoothies, or just by the handful. Mr Chai Organic Chocolate Chai – Fair Trade cocoa blended with warming spices. Makes an amazing iced chocolate for hot summer days. Mix with your favourite milk, pour over ice and top with a scoop of Little Island Salted Caramel Coconut Ice Cream. Alchemy Golden Turmeric Elixir – Some liquid sunshine for your morning wake up brew. Full of turmeric and spices, including black pepper that helps aid absorption. This drink goes really well with warmed coconut milk. Tom and Luke’s Super Slice – Gingerbread Bite Flavour – Gluten-free and vegan, these slices have so much goodness in them; almonds, acai, pea protein, maca, and lucuma to name just a few. Great for active adventurers who want healthy snacks. Hogarth Chocolate – Rose & Vanilla Tea Flavour – Gorgeous packaging is just the beginning. 70% cocoa, completed with organic vanilla and rose tea. So good it’s hard to stop at one bite. Dovedale GF Fruit Cake – The perfect mini Christmas cake for Gluten-free folk, very moreish with a cup of tea. Biohoney Baby Lotion – For Mums and Dads (and Bubs), this new product from Nelson company Biohoney is gorgeous and natural. There’s a whole range of skincare for little ones featuring active Manuka honey. I hope you have a happy and safe Christmas break with the people you love. Enjoy your foodie stocking stuffers. I will be back in the New Year with more tips, recipes, and inspiration. Everybody loves a Christmas Party, and nothing says party like bubbles…. Especially if those bubbles are in Champagne or sparkling wine. Of course, New Year’s Eve is the year’s biggest party, but Christmas Day is also a day to get together with family and friends to reminisce, talk about the future, eat too much and share a glass or two of wine or Champagne. I am of the belief you should drink less, but drink better; so, rather than buy three or four bottles of cheap, carbonated, sparkling wine, spend the money on one or two bottles of really good wine, and enjoy the delights that the wines offer. At this time of year you can buy premium French Champagne for your Christmas party, as well as very good, premium New Zealand sparkling wines. All at exceptionally good prices making it the perfect time to step up the wine quality without breaking the bank. The Grocer at Fresh Choice Nelson not only has an excellent range of Champagne and sparkling wine for you to choose from, but, as you would expect at this time of year, also at very good prices. The New Zealand favourite, Lindauer, comes in a variety of flavours and styles, like the Enlighten Sparkling Sauvignon Blanc or Pinot Gris. The classic Lindauer Brut, (if you like a drier style wine), or the Lindauer Sec (if you like something a little sweeter), all for less than $10 a bottle. 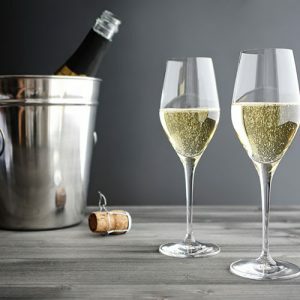 The next step up is wines like Hunter’s Miru Miru $26.99, Akarua Central Otago Brut $28.99, or, crafted by Daniel Le Brun, the master of sparkling wine in New Zealand, the No1 Assemble $28.99. Next in line are classic Champagne brands like Pier-Heidsieck GH Mumm, Lanvin and Moët & Chandon for between $50 and $100 a bottle. However you celebrate at your Christmas party or New Year’s Eve bash, make sure you do it with quality bubbles, shared with family and friends. Most importantly, be safe.